People access psychotherapy for many reasons. If you believe that you could benefit from developing new skills and realizing new insights to better your everyday life, regulate your emotions, or meet your full potential. Many people access counselling well before they feel out of control to help themselves build capacity to cope with change and challenge. In the first session, we will discuss confidentiality and expectations, and we will discuss your goals for therapy. If you’re unsure of what goals you have for therapy, we can develop those together. We will check-in during each session based on current situations, follow up based on insights developed since the previous session and realign with the goals that we set. Practitioners can vary in their philosophy and perspective of psychotherapy. 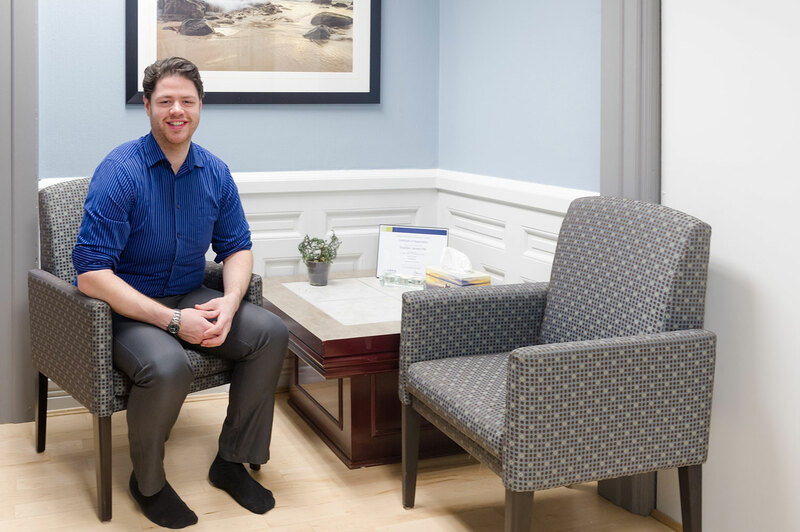 Sheldon firmly believes that his role as a therapist is that of a fancy mirror; the best work is done in partnership between therapist and client. Together we can work to develop new insights which can change behaviours, help regulate emotions, and challenge thoughts. Sheldon believes that every client has the capacity to grow and develop, and he believes he is privileged to be able to support clients in this way. We are excited to add another service to better your wellness at Campbell Care Centre by offering psychotherapy / counselling! We appreciate the challenges of everyday life, whether it be coping with loss, navigating relationships, understanding complex emotions or consistently leading with our values. Psychotherapy is helpful in coping with life stresses, but goes beyond that – many people seek out therapy to continue excelling in their life and to meet their full potential. Sheldon Hill, is a humanistic, person-centered Registered Psychotherapist (Qualifying) and trained at Western University. He works in a variety of models, including Acceptance and Commitment Therapy, Cognitive Behaviour Therapy, Dialectical Behaviour Therapy, and Compassion-Focused Therapy. He has worked in a variety of settings with clients experiencing a myriad of concerns. Sheldon is very excited to join the Campbell Care Centre team to help us align every client with their full potential. At this time, Sheldon is offering individual therapy sessions on Tuesday and Wednesday evening, and Sunday morning. Sessions are approximately 50 minutes long with no limit on the number of sessions for each client. A session costs $120.00 and many insurance plans cover psychotherapy.